Sue Gurland is the creator of Moving Through the Tree of Life. She has an extensive background in energetic and healing modalities. Moving Through the Tree of Life draws upon Sue’s lifelong experiences to integrate authentic Jewish practices with contemplative movement, meditation and visualization. The resulting exercises promote energetic aliveness, relaxation and a deep spiritual connection to the Source of All Being. As an acupuncturist, t’ai chi and qigong teacher, I’ve experienced the health benefits of moving energy through the body, including stress-reduction, increased energy and balance, improved physical and mental health. Most profoundly, these practices have put me in touch with a sense of connection to the Oneness, the interconnectedness of all Being. 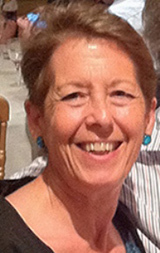 Sue holds a Master of Arts in Teaching degree from Yale University, a Master of Acupuncture degree from the Traditional Acupuncture Institue, and a Certificate of Completion in Jewish Spiritual Direction from the Lev Shomea Institute. She has been active in Women’s League for Conservative Judaism on the local, region and national level, and as a lay leader in her synagogue. In 2011, she received the Community Service Award from the Jewish Theological Seminary. She also participates in a Jewish Renewal havurah.